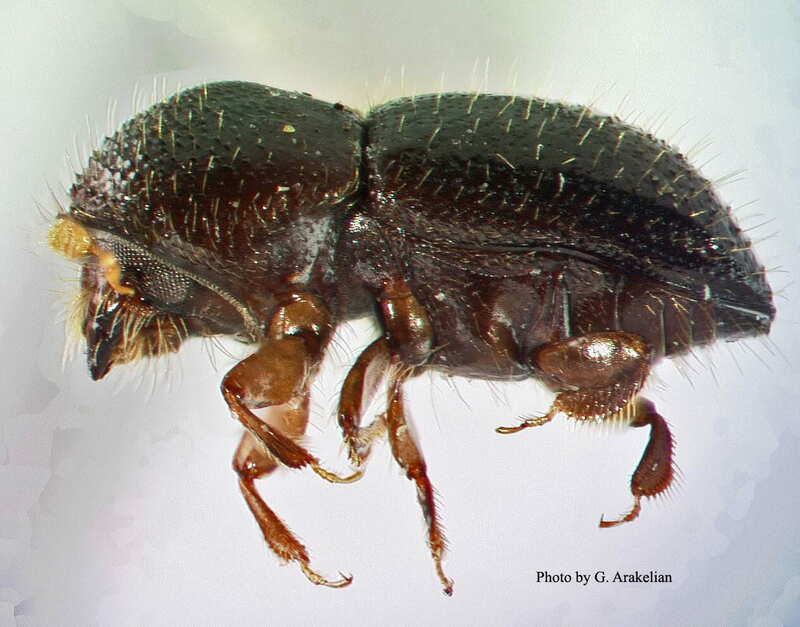 UCI has discovered that hundreds of its trees are infested with an invasive beetle from Southeast Asia that has become established in Los Angeles, Orange, Riverside, San Bernardino, and, more recently, San Diego counties. There is no effective treatment for severely infested trees; to treat them only lengthens the time it takes for them to die and increases the risk of injury to people and property, as well as the risk of infestation of other trees. The campus will need to remove a large number of trees to reduce the risk posed by falling limbs and to stem the spread of this infestation. UCI has assembled a team of individuals from across the campus to develop a management plan for identifying, removing, treating (if possible), and replacing the ravaged trees. The team includes representatives from Environmental Planning and Sustainability, Facilities Management, Environmental Health and Safety, Transportation and Distribution Services, Student Affairs, the Irvine Campus Housing Authority, and the Center for Environmental Biology in the Francisco J. Ayala School of Biological Sciences. The team is working closely with plant pathology and invasive pest experts from UC Riverside and the University of California Cooperative Extension, which are part of the University of California Division of Agriculture and Natural Resources, to manage this infestation. Campus staff are also working with other local land managers and public agencies to share information and coordinate responses. The information below comes from campus sources and UC ANR. What is killing the trees? 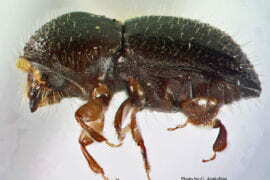 The trees have been attacked by the polyphagous shot hole borer, a tiny dark brown to black beetle that is less than 0.1 inch long. The females drill into trees to lay their eggs and introduce a pathogenic fungus that provides food for the adult beetle and its newly hatched larvae but also infects the host tree. 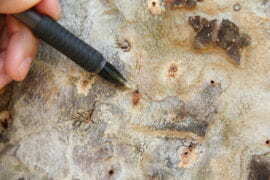 The larvae develop into adults in about a month and mate while still inside the tree. The pregnant females take some of the fungus into their mouths and leave through the holes created by their mothers to start the process again. Some trees seem to suffer mild symptoms like branch die-back while others are killed outright. Where did these borer beetles come from? The PSHB is a relatively new pest in California. It was first discovered in Los Angeles County in 2003 and was suspected in the deaths of a large number of box elders planted along streets in Long Beach in 2011. It appears that the PSHB is slowly making its way southward. It is now established in Los Angeles, Orange, and Riverside Counties, and a second introduction of another population has been found in San Diego County. A single beetle was caught in Santa Cruz County in 2014. It is believed that these two separate introductions of beetle are native to Southeast Asia. Map of beetle distribution in Southern California. How many trees are affected on the UCI campus? There are more than 25,000 trees on the UCI campus. 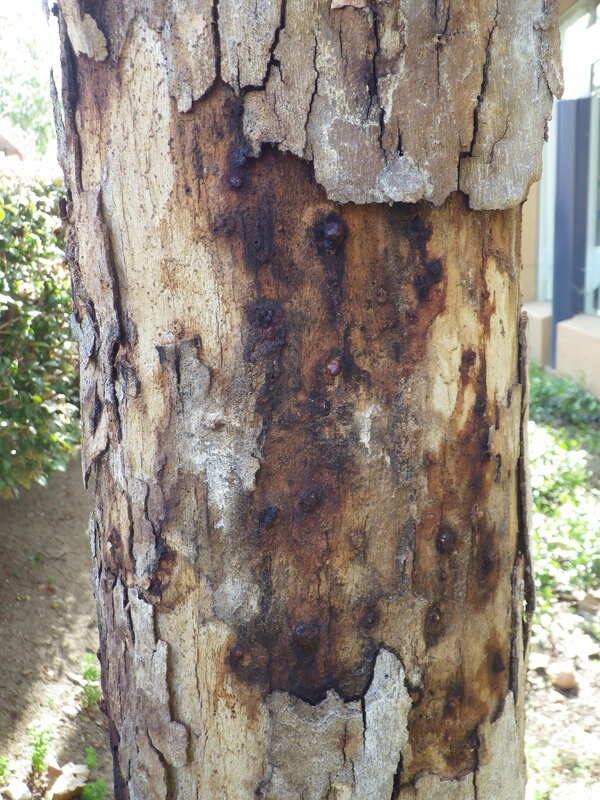 At this time, UCI staff have identified about 1,000 trees infested with PSHB, of which most will need to be removed. 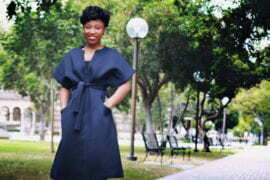 These are mainly in the academic core, in and immediately surrounding Aldrich Park and the Ring Road. 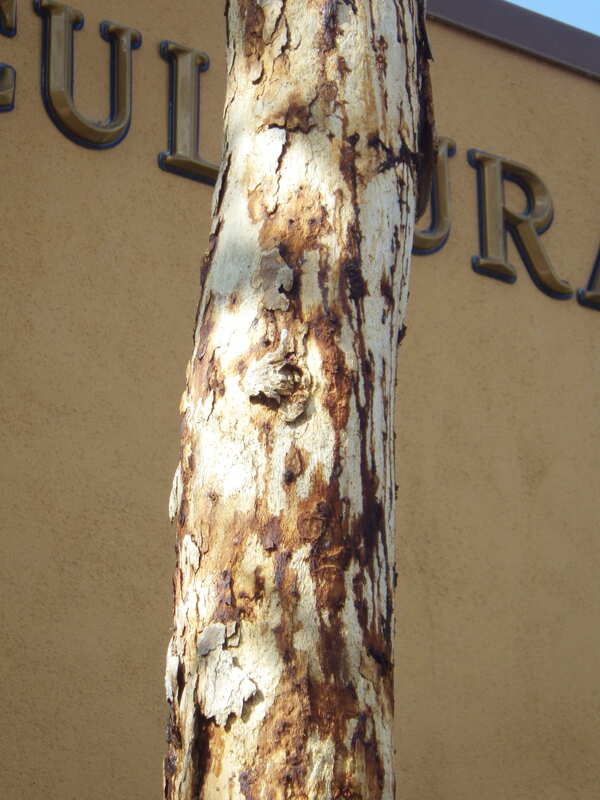 Infested trees have also been identified in surrounding properties, including public areas in University Hills. UCI and UC ANR researchers are working closely with neighboring communities to share information and address this regional infestation before it gets much worse. Campus staff are exploring experimental treatment and prevention methods in an effort to save the 40- to 50-year-old native sycamore trees in the central campus, as these specimens are part of UCI’s heritage and campus character. What types of trees are affected? 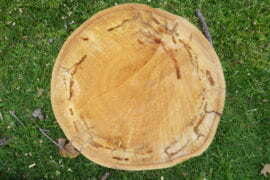 PSHB has been observed attacking as many as 300 species of trees, but some trees are resistant to the fungus it carries. There are 37 trees known to serve as reproductive hosts for this beetle, and about half of these trees grow on the UCI campus. 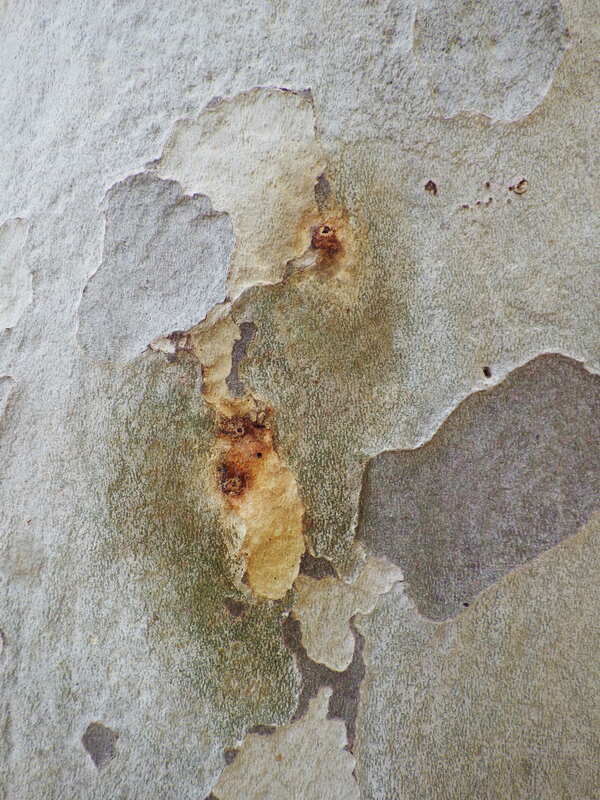 The vast majority of trees infected on campus are sycamore species, which are a favorite reproductive host. This includes the mature stands of sycamore trees in Aldrich Park and around the Ring Road. List of susceptible trees. Why wasn’t anything done about the beetles before? 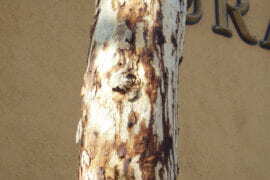 PSHB may have been present on our campus for two to three years, beginning as a light infestation that can have the appearance of similar, less virulent tree pests. 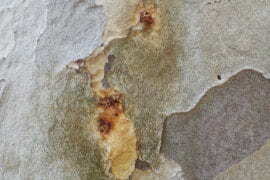 The extent of the infestation only became apparent in the last few months when a significant number of trees began showing severe symptoms. 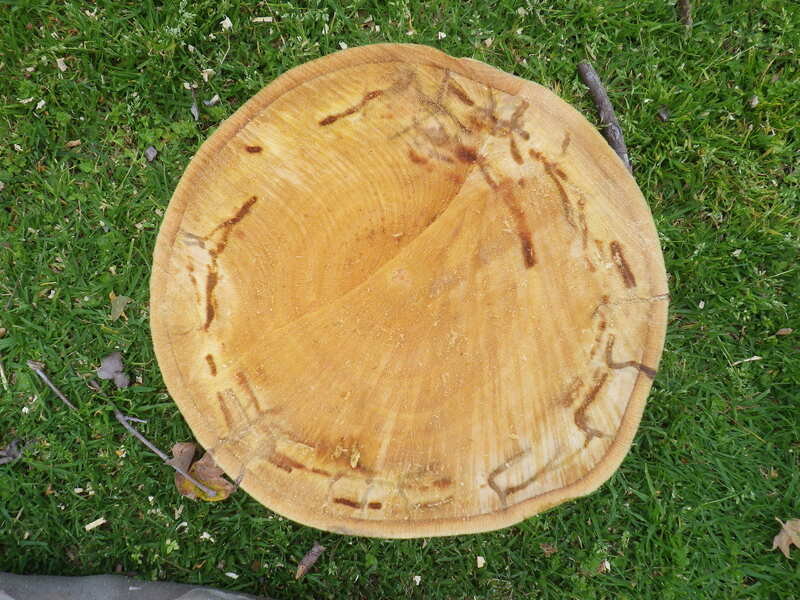 UCI groundskeepers began to more closely examine a number of trees that appeared to be particularly distressed and worked with UC ANR staff to identify PSHB in early 2015. That’s when they positively identified the tiny black-ringed holes that signal the presence of the fungus carried by the PSHB. 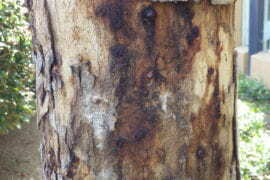 In many cases, the holes are only visible when tree bark is scraped away. 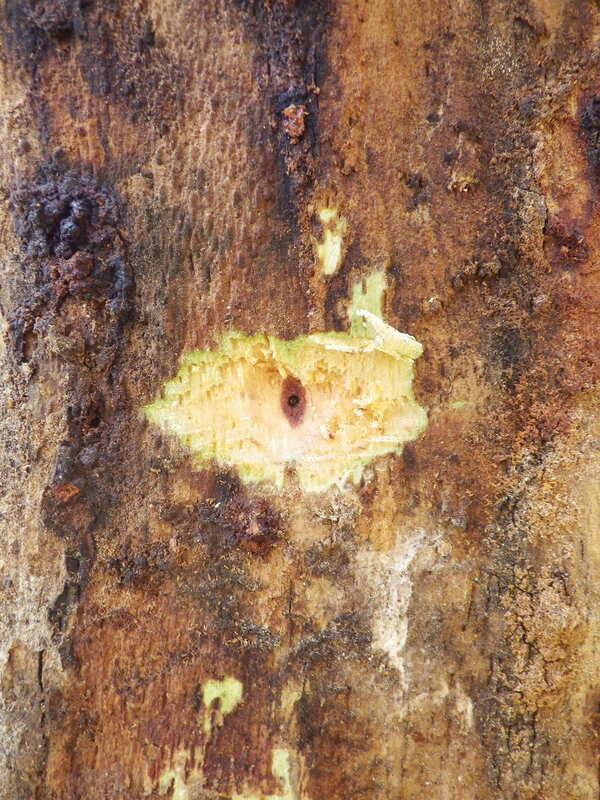 We are still in the process of locating infested trees and identifying the extent to which they have been compromised. Trees that are moderately or severely infested will be removed in stages over a period of months, with public safety being a No. 1 concern. Infested trees known to provide habitat to nesting species of birds will be maintained until mid-summer when nesting season ends. What happens with the trees that are cut down? The trees that are removed will be disposed of consistent with protocols developed by UC Riverside and UC ANR scientists to ensure that these operations do not contribute to the spread of the PSHB. We are examining a number of options and will be working with vendors that are licensed and qualified to properly dispose of the infected wood. Will UCI replace the trees that are being removed? Yes. We are developing a reforestation and tree management plan to replace the infected trees with species that are less susceptible to the PSHB. Water needs, size, appearance, and maintenance will all be studied in identifying suitable replacements. What happens to trees that are only minimally infested? UCI is working with UC Riverside and UC ANR, which has identified 13 candidate pesticide treatments. UCI’s Environmental Health and Safety department is evaluating all of these to determine which might be safe to use on campus. Since it is not known which of these treatments is effective in killing the PSHB, UCI will serve as an experimental field station, and findings made here will prove useful in helping to save trees throughout California. Who is deciding which trees will and will not be removed? And who will be monitoring this going forward? A team of UCI staff qualified in tree management is receiving training from UC ANR (UC Riverside and UCCE) to properly identify and assess PSHB infestation. The team will monitor all trees on the UCI campus and, with input from faculty and students from UCI’s Center for Environmental Biology, make the determination about which infected trees will be removed. 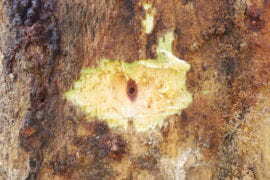 Where can I find more information about the shot hole borer? Find details about the pest on the UC Division of Agriculture and the University of California Riverside web pages. I own property in Orange County and want to know if my trees are affected. Who should I contact? If you suspect your trees might be infected, please read the “PSHB Symptoms and Lookalikes” leaflet. 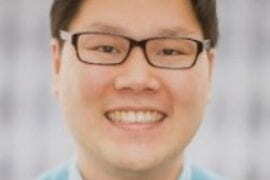 Residents of University Hills should contact Andrew Herndon, vice president of community development, Irvine Campus Housing Authority, Andrew.Herndon@icha.uci.edu. Area property owners should contact John Kabashima, MBA, Ph.D., Environmental Horticulture Advisor, University of California South Coast Research and Extension Center, 7601 Irvine Blvd., Irvine, CA 92618, pshb.ucce.oc@gmail.com. Polyhphagus shot hole borer, responsible for the demise of trees across Southern California, shown here enlarged. The actual beetle is about the size of a sesame seed.